March’s Foodie Fave: Marshall’s Haute Sauce – Damn, I Can Make That! A little while back, my friend gave me some dry rubs as a gift. And let me tell you, they blew me away. She got me the pack with Potato Rub, BBQ Rub, Seafood Rub, and Sandwich Rub. By the end of the summer they were practically gone. These spices really give an awesome punch to any dish. 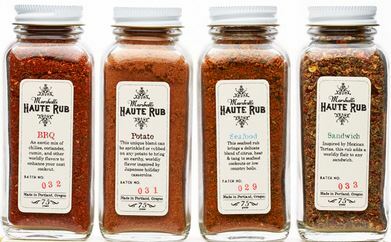 Like the bottles suggest, we used the Seafood Rub on seafood and BBQ Rub on burgers, ribs, and such, etc. But I also started putting them on veggies and they were just as mouth watering. If you don’t believe me, check them out for yourself. The best part is, the site makes it even easier for you by providing recipes to try. And honestly, with a name like Marshall’s Haute Sauce, why wouldn’t you want to try them? This entry was posted in Foodie Faves and tagged Gifts, Marshall's Haute Sauce, Rubs. Bookmark the permalink. Thank you Paulette! I hope you get a chance to try the rubs some day. They really amp up any meal. Pingback: Slammin’ Salmon Burger | Damn, I Can Make That!